Preparation of Biomass Corn Straw Derived Carbon Materials and Their Sodium Storage Performance QIN Decai;GAO Yuanqian;Luo Shan;WANG Jianchen;XU Guiyin;Shenzhen Edge Medical Robotics Co. The Preparation Technology of Crystalline Silicon Ingots for Solar Energy ZHOU Daliang;MING Liang;HUANG Meiling;QIU Hao;DUAN Jingang;CHEN Guohong;Hunan Red Solar Photoelectricity Science and Technology Co.
Research Progress of Super-hydrophobic Surface Insulators LUO Chuanxu;Yunnan Electric Power Test and Research Institute Group Co. Formation Mechanism and Control Solution of Welding Crack for Material used in High-parameters Steam Turbines ZHENG Liangliang;YANG Lin;XIONG Jiankun;CAO Tianlan;YU Yong;WEN Zhongbo;WU Haifeng;Dongfang Turbine Co.
Study on Application of Wheat Straw in Cement Based Composites WANG Jibo;ZHANG Kaifeng;ZHANG Tao;FENG Taotao;WU Chao;China West Construction North Co.
Study on the Anti-sliding Deterioration of Limestone Asphalt Mixture XIONG Jianping;LIU Ke;ZHAI Long;HU Bin;Postdoctoral Working Station of Guangxi Communications Investment Group Co. Influence of Soft Magnetic Powder Characteristics on the Performance of Metallic Soft Magnetic Powder Core LI Tianying;DING Wentao;GENG Wenbin;WANG Cancan;Anhui Shou Wen High-tech Materials Co.
Effect of Solution,Aging Treatment and High-deformation Process on Microstructure and Properties of Cu-1wt%Ag Alloy WANG Shusen;YAO Dawei;ZHANG Yuanwang;ZHAO Heng;LI Dongjun;Shanghai Cable Research Institute Co.
A Review on the Anti-creep Mechanism and Methods of Metallic Materials WANG Limin;ZHANG Guangzhou;YAO Hui;DENG Jingwei;CHEN Weilin;HAN Xiaotao;Wuhan Nari Power Engineering Technology Equipment Co.Ltd. 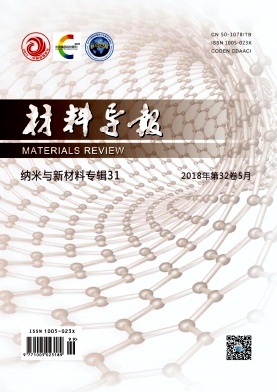 ;Power Research Institute of State Grid Jiangxi Electric Power Co.
Development Trend of High Strength Aluminum Alloys for Rail Transit from the Perspective of Its Application in Aviation WANG Wei;ZHANG Yong;YU Min;CHEN Hui;Avic Chengfei Commercial Aircraft Co.
Investigation on the Ferrite Transformation Measurement Methods During Continuous Cooling ZHANG Shulan;LI Hong;XU Lijun;WANG Chang;Central Iron&Steel Research Institute;Advanced Technology & Materials Co.
A Novel Shape-stabilized Phase Change Materials with High Heat Storage Density ZHANG Xiaoxing;CHANG Wei;WANG Hui;HUANG Zhankai;CNOOC Tianjin Chemical Research & Design Institute Co. Fabrication and Properties of PBS Toughened MWNTs/PLA Conductive Filaments for 3D Printing TIAN Wei;YU Wenhai;LUO Kun;LI Qianjin;ZHUGE Xiangqun;ZHU Min;TIAN Jin;DANG Shuo;ZHANG Guzhen;SHANG Hufeng;China United Northwest Institute for Engineering Design & Research Co.
Advances in Research of Water Swelling Materials LIU Qiang;HE Xi;Aerospace Kaitian Environmental Technology Co.
Research Progress on Reactive Polyurethane Hot-melt Adhesives CHEN Jinghua;SHI Junjie;ZHANG Jianzhen;CHEN Jianjun;HUANG Hengchao;Guangzhou Baiyun Chemical Industry Co.